[youtube]https://www.youtube.com/watch?v=0syxexBkADs[/youtube] Since we began dating, I’d been out to prove to my lady (now wife, aka the Game-Hating Girlfriend) that videogames do in fact contain “real” music. Many of you have probably had similar struggles with friends and loved ones! Lunar: Eternal Blue for SEGA CD has one of the finest videogame soundtracks ever made, and I think much of its piano and organ work would be great in a religious service (I was raised Catholic, but we now belong to a progressive, open-and-affirming church community). Despite the quality of the compositions, she constantly objected to hearing “fake” instruments on every game soundtrack I would play in the car (she’s since had to learn that game music is here to stay in our household!) I was all-too-eager to point out the validation of videogame music the first time the pianist at our church, Pilgrim Congregational, played a song by Nobuo Uematasu (who’s been composing Final Fantasy music since the ’80s) during service! [youtube]https://www.youtube.com/watch?v=5Q5C9WHm1_Y[/youtube] Hearing these gaming pieces on piano prompted Cait to say “That’s really pretty!” more than once. It really goes to show the quality of these compositions from ’80s and ’90s games when you hear them played by a master, live and in person! 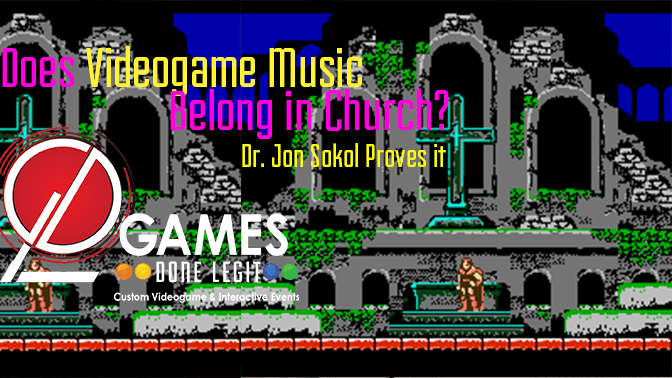 Videogame music in church is something I’m treated to now on a regular basis, thanks to Jonn! Now a good friend, Dr. Jonathon Sokol is an amazingly talented composer, arranger, and pianist/organist, and I’m proud to share his performances with the world!